Two turrets, beautiful colored glass windows, and 14 rooms are just part of what makes the Kimball House Museum a unique part of Battle Creek history. The Queen Anne style home was built in 1886 for Dr. Arthur Kimball and his wife, Marion. It was considered an upper middle class home at the time. Three generations of Kimball's lived here until it was donated to the community. The Junior League of Battle Creek was instrumental in preserving the home for visitors to enjoy. Today, visitors can enjoy the restored Victorian home and wander through the Pioneer Room, the General Store, servant quarters and more. A Sojourner Truth display of mementos and artifacts of her time in Battle Creek is on the second floor. It is open to the public on the 1st and 3rd Sunday's of the month, from 1-4 p.m. The Historical Society of Battle Creek runs the museum now. The Historical Society offers great educational activities and programs here. I have attended a few. The Kimball House Museum is a Michigan Historic Site. Harlan A. Poor, the son of Samuel B. Poor and Eleanor Begole Poor, died 12 May 1864 during the Battle of Spotslyvania, Spotslyvania County, Virginia. Harlan A. 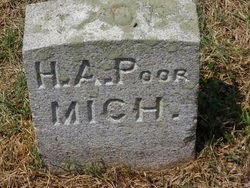 Poor is my second great grand uncle. He was a private in the 17th Infantry for Michigan. Harlan A. Poor was originally buried at Beverly's Farm in Spotslyvania, Virginia. He was removed to Fredricksburg National Cemetery, Fredricksburg, Virginia. He is buried in grave number 1205. Where in the World is Samuel Stillman Glover, Jr.? I am an organizer! I enjoy being organized around the house and with my genealogy. One of the things that helps me in my research is to create charts. 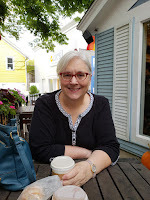 My "Where in the World" posts help me see where I have gaps in my research. Samuel Stillman Glover, Jr. was a traveler. He moved numerous times and this doesn't even count his service during the Civil War or when he was in Milwaukee, Wisconsin for a short time in between census years.